Nagaur is situated 135 km from Jodhpur in Rajasthan. Nagaur with its massive ramparts and impressive gateways is one of the fascinating towns of Rajputs. 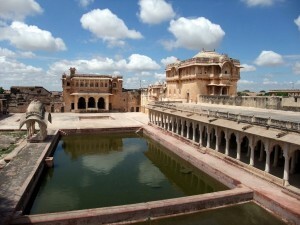 The historic Nagaur fort houses splendid palaces, temples and palatial mansions. Some of the beautiful places within the fort including Moti Mahal, Badal Mahal and Hawa Mahal are all splendid architectural creations. The courtyard has painted walls adorned with some exquisite frescoes and lovely mural. The distinctive highlights of Nagaur’s temples are their decorated walls and entrances, ornate with beautiful paintings depicting various episodes from the great Epics of Hindu “Ramayana and Mahabharata”. The paintings in the Jain temples depict motifs related to the life of Lord MahaVira and Parasavnath. The “ Tarkin-ka-Dargha” is a noteworthy 15th century Mosque worth visiting. The brasswares of Nagaur are also very popular. Nagaur is the venue of an annual cattle fair held in January and February. Best visited in the Ramdeoji fair in February and Tejaji fair in the month of August. This entry was posted in Nagaur, Rajasthan and tagged nagaur city, Nagaur Fort, Tarkin-ka-Dargha. Bookmark the permalink.